It’s ironic that “Divergent” encouraged its viewers to stand out from the crowd when the film was so clearly trying to be like “The Hunger Games.” For what it was, “Divergent” at least had some striking visuals and a likable central character. “Insurgent” is another good-looking, well-acted entry to the series. The problem is that this sequel doesn’t just feel like more or less of what we already got in “Hunger Games.” It feels like a retread of the previous “Divergent” picture too. Shailene Woodley is back as Tris Prior, a Divergent who’s been singled out in a society separated into five factions that only diehard fans of Veronica Roth’s novels can remember by name. She’s still on the run with her much older boyfriend Four, played by Theo James. They find an ally in Four’s estranged mother (Naomi Watts), who wants to start a rebellion against the corrupt Erudite faction. Oh yeah, because we don’t have nearly enough young adult adaptations about teenagers fighting the big, bad government. What the rebels don’t know is that Jeanine, the Erudite leader once again portrayed by Kate Winslet, has come into possession of a mysterious box that can only be opened by a pure Divergent. Gee, wonder who that could be? Woodley is one of our most promising up-and-coming actresses and one of the few people on the planet who can pull off a pixie cut. Although she’s not given an extraordinary character to work with on paper, Woodley does bring a great deal sympathy, depth, and strength to the role. Her chemistry with James still isn’t anything breathtaking, but we fortunately don’t have to sit through any love triangles or will they/won’t they tension. The supporting cast additionally does fine work with Miles Teller as Tris’ rival Peter, who keeps switching sides, and Ansel Elgort as Tris’ brother Caleb, who also keeps switching sides. Sadly, they’re all stuck in a meandering story. Most of “Insurgent” simply comes off as filler until next time. The same could be about “Mockingjay – Part 1,” but the filler in that film did make leeway for some strong character development and political commentary. Here, you’re constantly waiting for the plot to take off when matters just keep going back and forth. There are so many pointless scenes, most of which come in the form of dream sequences that give the climax of “Breaking Dawn – Part Two” a run for its money. Even the virtual reality action set pieces, while exquisitely rendered, can get old rather quickly. 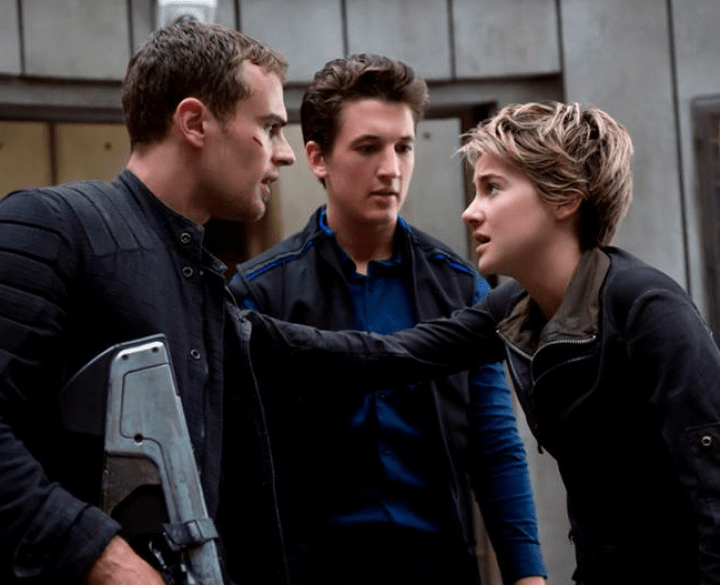 At nearly two hours long, “Insurgent” easily could have been cut down to forty-five minutes. It’d almost be worth sitting through the more redundant parts if the ending were full of shocking revelations. Without giving too much away, though, the big reveal is no different from the endgame twist we got in “Maze Runner.” Exactly how many other books can this franchise rip-off? Nevertheless, the film’s conclusion does leave things open for some potentially intriguing further adventures. Seeing how the narrative is already starting to feel dragged out, however, it’s hard to get especially excited about the next two chapters. If this series really wants to stand out from the crowd, maybe it should just produce one more sequel and bring back traditional movie trilogies.